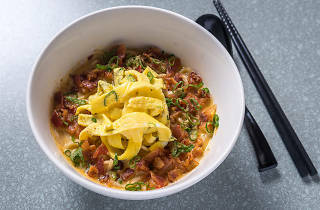 Ivan Orkin has never been one to play by the rulebook—the brash, Yiddish-tongued Long Islander first built his food-world fame not in his native New York, but 6,000 miles away in Tokyo, where he stirred up Japan’s devout ramen congregation with his light, silky slurp bowls in 2007. 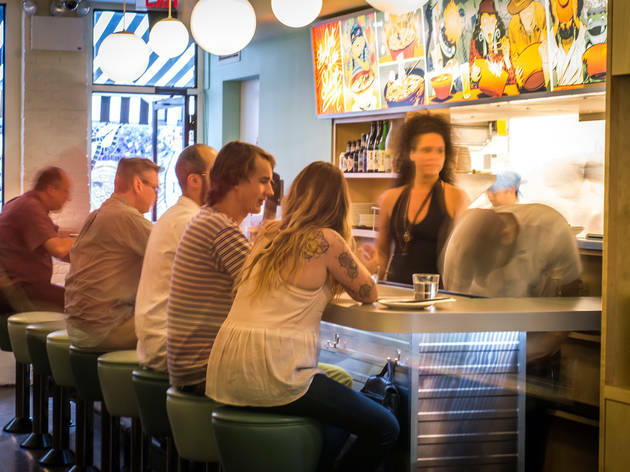 Fast-forward seven years, and there are four Ivan Ramen locations dotted across Gotham. 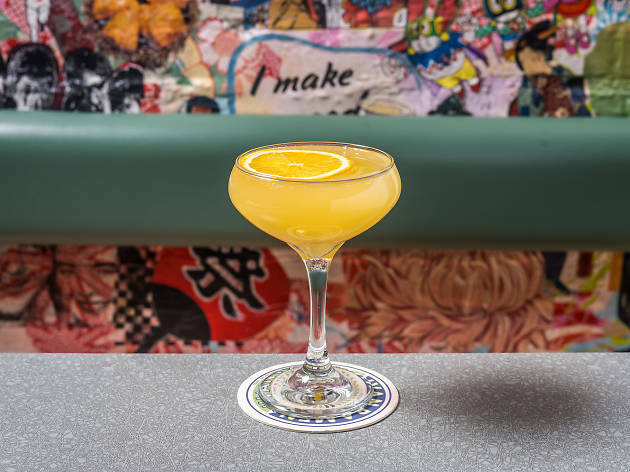 This vibrant 60-seat parlor tangles together the noodle virtuoso’s all-American roots and Japanophile leanings: A chrome-edged counter and vinyl stools recall old-line diners, blond-wood banquettes look plucked from a late-night izakaya, and a massive, papier-mâché mural in front is a kaleidoscope of Dolly Parton, John Wayne, waving lucky cats and Technicolor geishas. 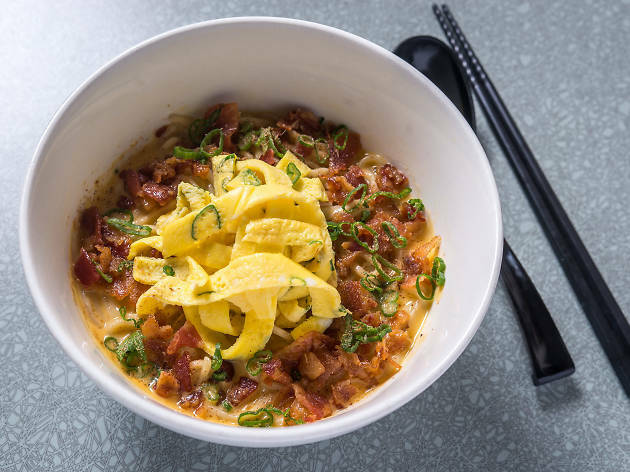 And the menu follows culture-crossing suit: Along with his seminal rye-flour noodles (in both shio and shoyu varieties), there’s four-cheese mazemen, like ramen gone Kraft, and fried chicken hearts—double-dipped à la KFC—with ponzu honey mustard. 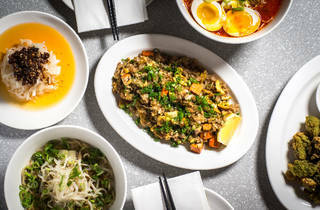 The downtown spot won’t serve rice bowls—you’ll have to shoulder up to Hell’s Kitchen for that smoked-whitefish donburi—but it does offer composed small plates, like preserved hen eggs and braised ox tongue. 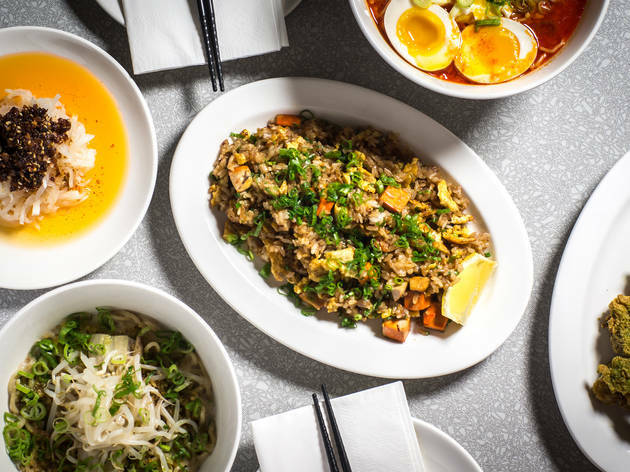 This is a great Ramen Spot on the LES. Its interior decor are unique and quite interesting and fun to see when you walk in. Makes you feel like your in a restaurant in Japan. 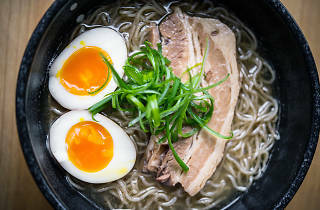 The ramen, especially the spicy one is very tasty. However the sake and alcohol were def over priced. Otherwise a good spot to try out but remember make a reservation of get there alil early cuz they do get a waiting list and it could be a wait especially cuz the place isn't that big. I love that this place is hip and has a heated back space. 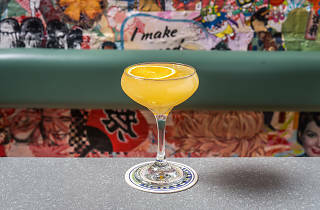 The pairing of a cocktail at a sister bar Subject ( see review there) as a place to go was a great incentive to wait the hour long line. But..... I did not love my spicey ramen with pork and bok choy. It was too heavy on red sauce spice and grease. The cauliflower in miso butter was too moist but the pickles and pork buns were wonderfully perfect, as was the server Jonathon. I'll go back and try the Ivan classic, tomato traditional ramen with chicken. Amen ramen. I've seen Ivan Orkin featured in a lot of shows so I was eager to try his ramen. The location doesn't feel authentic at all; I felt like I was in a toy store or something. Honestly, it was just weird. The food was unremarkable. Make sure you ask for the hot sauce since the ramen isn't really spicy at all. Definitely does not live up the hype! Cons: Spicy Red Chili Ramen was very hot if you are not prepared for it! Went with 3 friends for dinner. It was a great atmosphere and amazing local drinks. 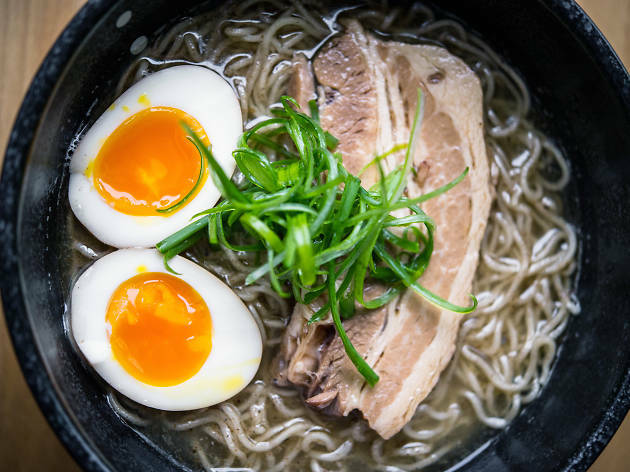 If you want to grab authentic ramen in a NYC style back patio this is for you. Trendy meets authentic. This is always a fun spot to come for dinner. 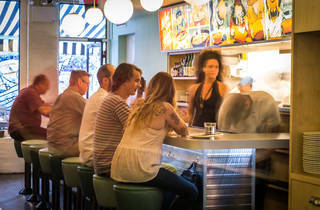 Their Spicy Red Chili Ramen is one of my favorites bowls in the city and the decor and atmosphere is always vibrant. Their Latke Nomiyaki is also a tasty Jewish take on the traditional Japanese okonomiyaki. I can't wait to come here to try their bottomless brunch.